Oppo Find X is priced at Rs59,990. Specifications include an HD+ 6.42-inch bezel-less display , Snapdragon 845 SoC, 8GB RAM and 256GB of internal storage. 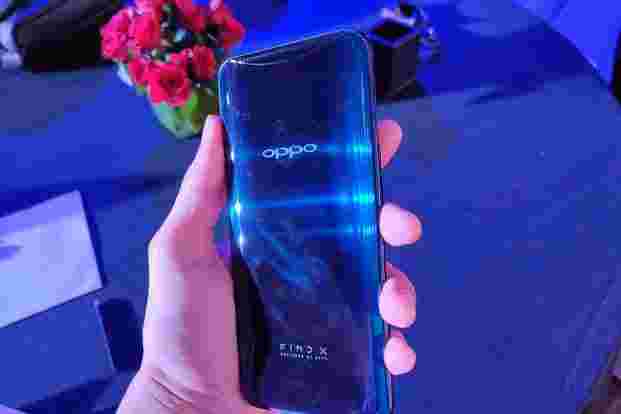 New Delhi: Chinese smartphone maker Oppo launched its Find X smartphone in India on Thursday. The Find X was unveiled globally on 19 June at an event in Paris. The smartphone is priced at Rs59,990 and will be available online through Flipkart. Pre-orders will start from 25 July and the handsets will be available from 3 August. A Lamborghini version of the Find X is also announced. Oppo will unveil more details on that in the coming weeks. Find X boasts a unique motorised camera slider mechanism that houses both the front and rear-facing cameras and other sensors. This extreme solution was designed to take the bezel-less trend a ‘notch’ further, removing all sensors from the top bezel. This gives the handset a screen-to-body ratio of 93.8%, one of the highest in the business. In terms of design, the Find X has a full glass body with a metal frame sandwiched in between. It comes in two colour variants, Bordeaux Red and Glacier Blue. The colours radiate from the sides of the back panel with the middle being black. One thing missing from the phone is a fingerprint scanner. To unlock the phone you have facial unlocking through the motorised slider called the O-Face. For added precision and security, it uses 15-dot, 3D facial recognition. Oppo claims this is more secure than fingerprint scanning.